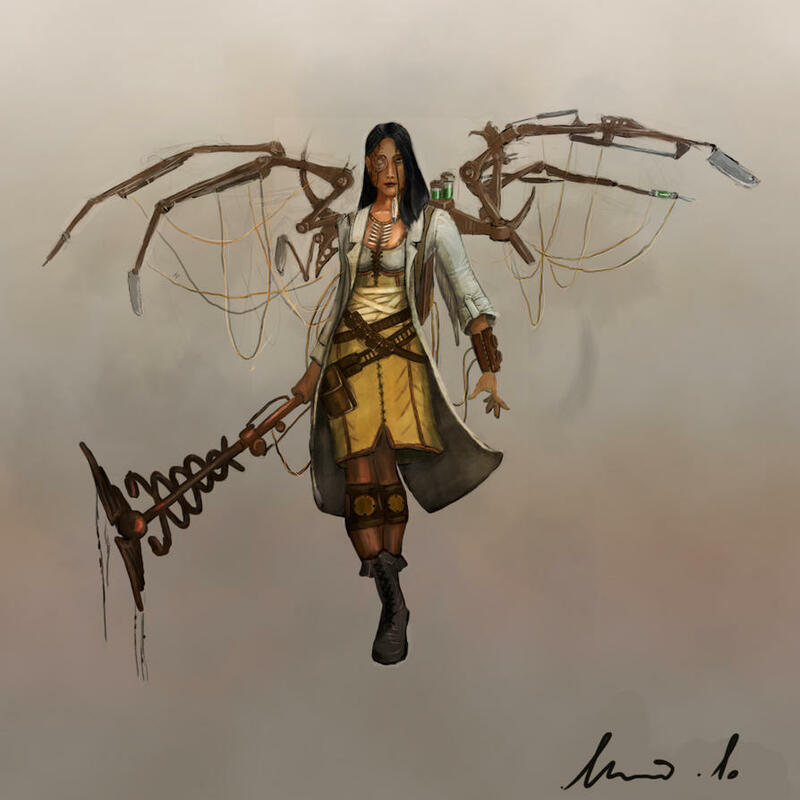 Here's a picture I found when googling "steampunk healer". I really liked the idea of the character having wings, since it would allow them to get closer to whomever needs healing faster. Apothecaries would use medicines instead of magic, thus having to be in a close range in order to heal someone. Their ability to fly would allow for some pretty awesome abilities in their talent tree if the character was built to be DPS. Since they fly, though, ranged attacks would mess 'em up. I liked the idea you guys mentioned about dark/light priests. It would make it easy to separate their talent trees for support and for dps. 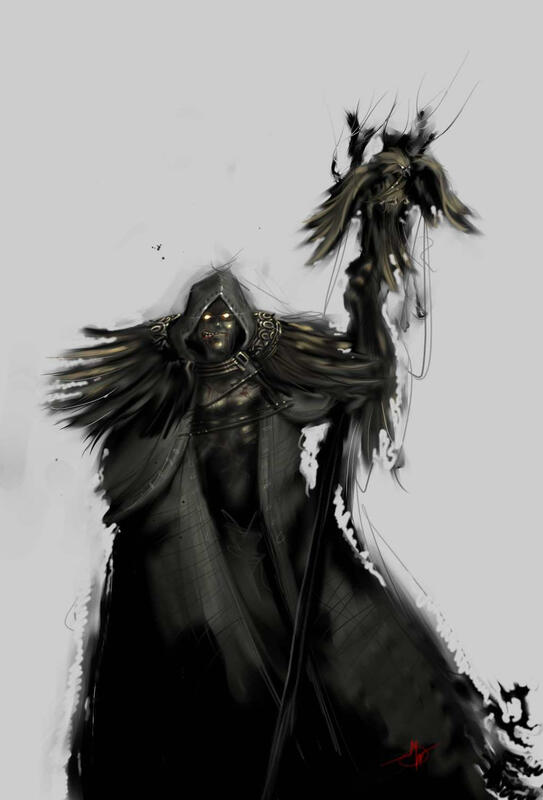 Maybe, as traditional fantasy priests, they have some sort of divine protection from ranged and magical attacks. They'd take high damage from physical attacks since they're squishies to even it out. Just trying to think up something to counterbalance fantasy priests with apothecaries' ability to fly? What if, in order to keep the game mechanics simple, each class had its standard role as a talent tree, and the other being a DPS role? Not sure about assassin/hunter, maybe as a disabler or something... traps and whatnot. Or maybe even just ranged or melee DPS? Otherwise, there'd be a juggernaut/knight-type defensive tank or a high DPS berserker/warrior, traditional healing priest or wrath-of-the-gods kinda dude, maybe wizards/technomancers being summoners or AOE dps? Just an idea. Maybe give the apothecaries spears or something since they're not ranged? Their DPS tree turning them into a Legend of Dragoon-type dragoon/paladin with medicine vials kinda character. More of a melee/healer than the DPS priest's ranged healing/DPS? I don't know what'd separate a DPS priest from a DPS mage, though. Maybe curses that do DOT like warlocks from WOW, mixed in with buffs and healing skills. Kind of an all-arounder...? Yea, normally mages and priests are fairly similar with DPS, accept that mages get more out of the INT stat and have AoE, where Priests tend to be single target(other than heals). That sound good tho.